Nine times out of ten, when I get home from work, my husband is going to ask me: “What’s for dinner?” And when we invite someone over, I always (ALWAYS) hesitate to make anything…I mean, what if they don’t like it? But whether they like home cooking or not, this is the recipe that all my guests love. Every. Time. 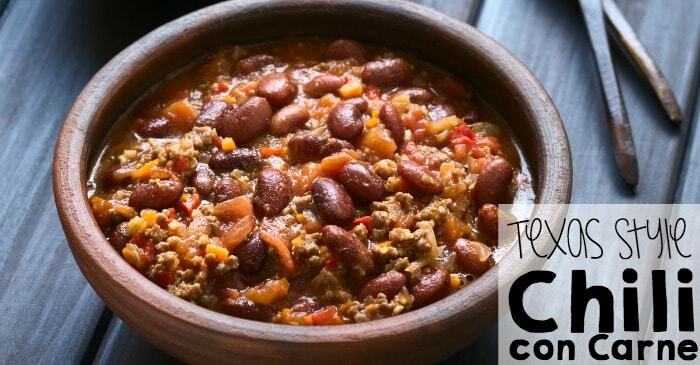 Best part is, you don’t have to spend all day cooking, and Texas Chili con Cane is comes out flavorful and tender. So, it’s perfect for those evenings where I’m making dinner for the family–or for guests headed over. And, this recipe is great for freezing and eating later. We do that in the winter quite often. So, pretty versatile. LOVE IT! 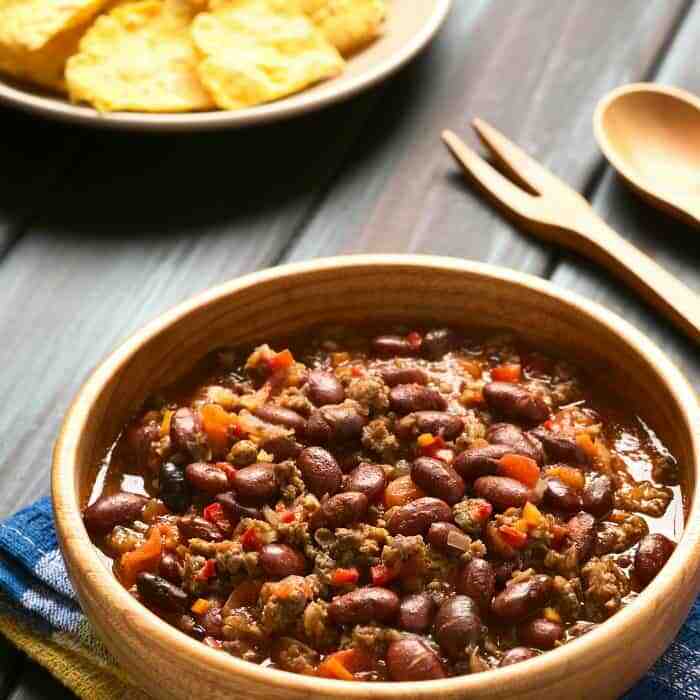 You don't have to spend all day cooking, and Texas Chili con Cane is comes out flavorful and tender. So, it's perfect for those evenings where I'm making dinner for the family! In a large skillet (or a dutch oven) over medium heat, brown the ground beef, chopped onion and garlic, then drain on a paper towel. Place meat back in the skillet. While the meat is browning, place the tomatoes in a blender or food processor and chop into small, bite-sized pieces.Set aside. Bring meat back to cooking temperature, then sprinkle with the 1/4 cup of Flour. Stir. Add chopped, stewed Tomatoes to the beef and flour mixture. Stir and, using the tomato can, add a can of water. Stir. 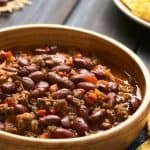 Taste and add more Cayenne if you want your Chili to be more spicy--or, just bring the Cayenne to the table, and let each person spice up their own bowl! Add beans, f that's your bag. Continue to cook and stir for about 5 minutes, or until the mixture begins to slightly thicken. Serve with hot dogs, crackers, corn chips, or hot water cornbread. 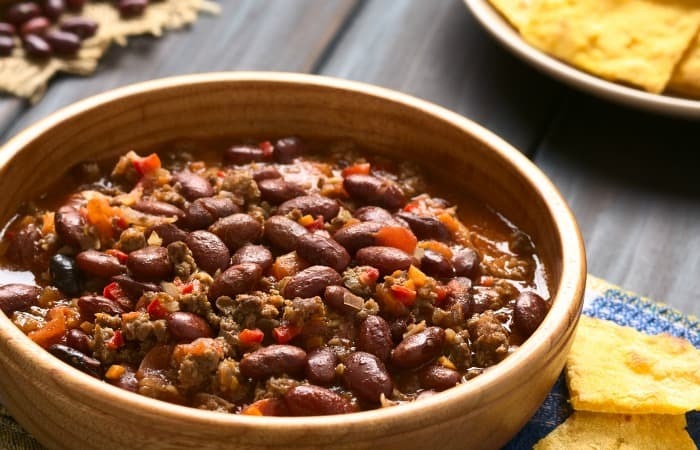 I hope you and yours enjoy this Texas Chili con Carne as much as my family does! Let us know what you think, and be sure to like NerdyMamma on Facebook so you see all our fantastic recipes right in your newsfeed.